Better than expected, it might not be anything great, but the effects are cool and the movie is actually a good deal of fun. This is an enjoyable adventure movie. the story is just okay, but it leads to some really cool action and some unusual fun. The movie explorse two made-up lands, the kingdom down on earth and the giant world up in the skies. this is a bryan singer film, which means it takes its time with details, and that really goes a long way. 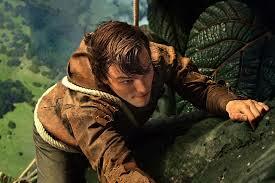 The climb up the stalk, for example, is not just a quick move, but a multi-day journey. The story might begin in some very cliched ways, but once Jack gets up to the world of the giants, the real creativity of this film begins. The effects are really great here, using computers for the giants in a way that makes them feel like real characters. this never reaches any great heights, but as far as fantasy action movies go, it gets the job done. I wasn’t sure how i was going to feel about this one, and came away being pleasantly surprised. there’s no question about it, the movie has reasons to be doubtful. it’s a movie about jack and the beanstalk, for one thing. wasn’t that story pretty simple and merely about magic beans and a giant? well, in the hands of director bryan singer (the usual suspects), this is much more of a wild ride fantasy, including a kingdom and a castle as well as a whole army of giants. the main reason to be doubtful about the movie, however, is the major use of computer effects. bryan singer is the guy who made x-men and x-2. he’s the guy who made the night crawler character in x-2, a real, living and breathing actor’s portrayal (alan cummings, pulling off the role brilliantly.) Singer could have easily gone the gollum route with that one, making the character completely cgi, only he didn’t, and the results were terrific. so why is singer choosing cgi for his giants right now? the answer is that it really is the only way to go for these character. using cgi on the giants is actually the right move. it is a huge load off, seeing that the effects look fairly realistic. and you can imagine that if these giants were played by real actors, they would probably just look silly and ridiculous. but the computer effects here go a long way. they are absolutely state of the art, and singer doesn’t use or abuse them anymore than he has to. 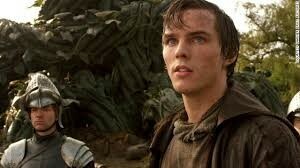 the movie is about this poor farmboy, jack (nicholas hoult), who goes to town one day to sell a horse. he ends up being given magic beans by a priest in the castle, who tells jack that he can bring the beans to the abby and get paid money in their place. jack accepts the beans (not really having much of a choice), and returns home to his uncle, who gave him the horse to sell. before he does this, however, jack has a run in with the princess. the opening scenes are pretty dull and routine. jack meeting the princess and seeing who she really is happens to be a very cliched scene. it’s right out of aladdin, with the boy rescuing princess jasmine only to learn who she really is. the real fun of the movie doesn’t start until the beans get wet and grow into a giant stalk. now, the adventure really begins. the movie definitely has some problems and inconsistencies. it’s simply a coincidence, for example, that when the princess runs away, she runs right to jack’s home in the countryside, just happening on it by chance. it’s also a coincidence that this is the same moment when the beans have gotten wet and turn into a giant beanstalk. finally, i really didn’t like the scene where roderick (stanley tucci), cuts a vine on the beanstalk and a whole bunch of men are killed. i certainly like the darkness of the scene and the idea of it, but are we to believe that none of these men were holding onto the beanstalk and that they were all just dangling in the air from a vine? A better scene would have had roderick and his henchmen suddenly attack the men and push them off the beanstalk. luckily, once the characters reach the land of the giants in the sky, the movie no longer has any problems. now it’s just fun effects and cool adventure. the story takes a little time exposing the giants to us and it all works out well, in a jurassic park, hear the t-rex coming and see the goat that it’s about to eat, kind of way. when the giant takes some of the knights prisoners, he brings us into a kingdom filled with a whole group of enemies and a two headed leader. the movie goes for jokes a little bit here, and none of them really work, but i’m just glad it didn’t overdo it. the jokes are mostly in the background and never take the place of story or action. the head knight in command is played by ewan mcgregor and it’s nice to see a familiar face on board here mixing it up with the little known stars (hoult is rising more and more these days, but the princess is played by an unknown.) still, this movie isn’t about acting. it’s about action and effects and some storytelling as well. once the action gets started, it’s all done pretty well. there are some scenes with the giants up in their world in the skies, and then they come down to the kingdom for the later parts of the movie. a lot of things work about the story and ways that it’s presented here. i like that a character who seems like the main villain is disposed of with about a full quarter of the movie still left. it makes the movie feel like there are multiple stories going on at once, and like their are other enemies to take that character’s place and bring us into an exciting climax. i also like the final action moments which have jack battling a creature in the giant halls of the castle. 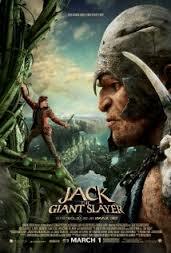 jack the giant slayer is definitely enjoyable and fun. it’s not great for a whole slew of reasons, starting with it’s very basic story. the screenplay (by christopher mcquerie, the guy who wrote suspects for singer) is fine and definitely adds some nice touches to the original fairy tale, but everything that happens in the first act is just too cliched and expected. even still, you watch a movie like this for the action and effects and they are all done really well here. as far as campy, goofy fun goes, this movie has definitely got it.